In case you needed reminding (and don’t worry, there will be another reminder), the Homes (Fitness for Human Habitation) Act 2018 comes into force for new tenancies this coming Wednesday, 20 March. Our thumbnail guide is here and some thoughts on ‘fitness’ in relation to Section 1 Defective Premises Act 1972 cases here. And MHCLG have published their guides. But obviously, everyone will be in need of a more detailed legal and practical guide to the new landscape for housing conditions. 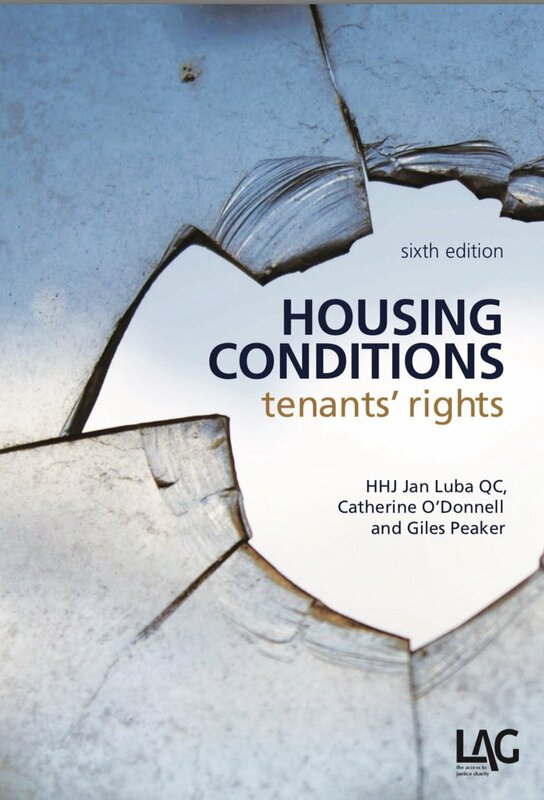 So how fortunate it is that Legal Action Group will be publishing “Housing Conditions: tenants’ rights” in April, in a thoroughly revised edition to include the H(FFHH)A. It is available for pre-order now. Yes, I am one of the authors. And yes, this is promoting things, which we don’t do on the blog, but this is one of those ‘my site, my rules’ moments, and I’ll live with the hypocrisy… Also, it is really rather good, despite my bits. In other potentially forthcoming things, the landscape on security of tenure for private sector tenancies looks increasingly interesting. First Labour announced that it was committed to introducing indefinite tenancies – the abolition of section 21, in effect. Then, somewhat surprisingly, the Centre for Social Justice published a report on improving security in the private sector. Yes, that Centre for Social Justice, the one set up by Ian Duncan Smith, the incubators of Universal Credit, and not noted for their left wing leanings. This report (albeit slightly contradictorily) recommended a four year minimum term and the ending of ‘no fault’ possession – the abolition of section 21. The Government’s response to the MHCLG consultation on private sector security of tenure is awaited. But these two announcements coming within the same week strongly suggest that the once unthinkable – the abolition of section 21 – is now a live policy issue, and not just for Labour. Devil will be in the detail, as ever, but interesting times…. Posted in Assured Shorthold tenancy, assured-tenancy, Disrepair, Housing law - All, Possession, secure-tenancy. Much chatter on landlord websites and fora suggest that many landlords would happily drop s21 if s8 were made easier and faster. Seems like this report is taking that line, so there may be a genuine prospect of seeing the death of this hateful procedure that has wreaked havoc for 30 years. Trouble is, you can’t differentiate between genuine S.21 procedures and those that should be S.8, as lots of LL’s use S.21 because S.8 was never fit for purpose, which it clearly isn’t. Anyway, be careful what you wish for, this nonsense will have LL’s leaving the PRS in droves. All s.21 procedures are ‘genuine’. On section 8, there are three overlapping issues, procedure is complex, requirement for evidence, and court delays and administration. We manage 150 properties. We have been in business for 8 years. We have never evicted under Section 21. It’s always been Section 8. It’s always ended up making more sense from a time perspective. There is however the fact that some landlords used to serve Section 21 notices at the start of the tenancy as a matter of course, and presumably nowadays serve them four months in and regularly thereafter – I agree, hateful procedure. A claim for rent arrears under S8 is already quite simple through PCOL. A reasonably savvy landlord can do this themselves without any outside help. The issue with Section 8 comes when it comes to antisocial or criminal behaviour etc. PCOL cannot be used. At this point, we’re in the weeds of civil procedures and evidentiary requirements which most people (including me!) have no clue about. Solicitors are essential in these cases, but the requirement for witness statements for (for example) threatening behaviour is, as you can imagine, troublesome. Not that I can think of any way around it. Unfortunately. If we were to encounter this situation going forward, we would most likely advise seeking eviction under Section 21 as getting the required witness statements from the aggrieved parties (usually not the landlord, nor the agent, but neighbours) could prove impossible under Section 8. In THIS instance, I couldn’t advocate for dropping Section 21, even though I know the harm it can and does cause to tenants. I do think that in general, PCOL does demonstrate how the legal process can be made simpler, both for claimants and defendants (who are, as far as I’m aware, able to file their defence online). Have these questions been answered already in Scotland? I’ve heard that seeking possession under certain grounds has been made easier for Private Residential Tenancies but have never looked into it myself. True on the unknown reasons for landlords seeking possession under s21 for a variety of reasons John but I’m still happy to wish for abolition. Landlords may sell up en masse but they cant take the properties with them. They will still be available for use in the community.Maybe not with PRS landlords owning them. Might just make for a new and more creative and inclusive landscape. The report calls for more accelerated grounds for s8 and I dont have a problem with that either.but as you say Giles, it isnt just a case of changing the law. The courts have to be able to provide faster eviction services where tenants are at fault but with nearly 200 courts being closed in the past 7 years it isnt going to get any better, regardless of how they streamline possession applications. Closing courts and selling off the real estate on the basis that online courts will be faster and more efficient is a great idea but shouldnt we have the online system in place before you sell off the real estate? Unfortunately a HMO providing 5 units of accommodation that becomes a family home means a reduction in supply of 4 units of accommodation. Unless it goes to another landlord. We will have to see what the evidence looks like, as so far the figures on a reduction in rented properties are so small as to be within a sampling error. At a time of a rapidly increasing population, a large proportion of whom needing to rent, it’s not a good idea to decimate the PRS without anything to take its place. “At least 320,000 people are homeless in Britain, according to research by the housing charity Shelter. Bertie, that just means landlords buying properties at a slower rate, not a fall in the number of landlords or properties for rent. The obvious problem with that being they don’t build any more properties going forward. Fine if we had a declining population. Private landlords don’t build properties (except for the large institutional landlords, who are the least likely to be bothered). Unless you mean in the literal sense of picking up a trowel, then of course private landlords build properties. They are responsible for the building of thousands of homes. Properties don’t disappear, they just don’t exist in the first place. Oh, you mean they buy properties that otherwise people might have bought to live in. Wow! Just Wowww! Would it be fair to assume building, property development and financing are areas you know not of what you speak? What will be the consequences of driving out private landlords through punitive taxation and legislation? Bearing in mind it would take at least 5 years for social and institutional landlords to gear up to that level, even if they had the will and means to do so. Bertie, you said landlords build properties. They don’t (with the exception of the large institutional landlords, as noted). Now you are claiming that speculative development by developers would cease if landlords weren’t buying off plan, and that this counts as landlords building properties? Taxation is not my brief. I can’t think of any punitive legislation in general. There is legislation that is intended to punish poor behaviour by landlords, but the answer to that is simple. Be a responsible landlord. We’ve heard the ‘sky is falling’ thing in response to everything from the 2004 Act onwards. Yet still the PRS grew. It might just be reaching its natural plateau now, we’ll have to see. Landlords buy off-plan providing finance for developers to develop. About a year ago one of the big builders reported in their annual accounts that starts had declined because of the weakened demand from landlords. People who do not have a hope of getting a mortgage (currently) rely on PRS for housing because there is insufficient social housing. What is the difference (in social terns) between someone buying a property to live in and someone buying a property for someone who cannot buy to live in? But then it is a very risky thing to do. Off the top of my head, I can think of 6 major speculative developments that were either so badly constructed as to be banned from being lived in, or where development has ceased, and the money has gone missing. The demise of what was a short burst of wholly speculative development of largely inappropriate and unnecessary kinds of building off the back of a bubble of BTL is probably not to be lamented, as it has left various cities with an oversupply of ‘student housing’ and a severe lack of family housing. a) council planning departments (or SoS on appeal) grant permission for inappropriate properties to be built? b) council department that is responsible for ensuring that new builds comply with building regulations and planning permission do not identify deficiencies? c) The government is investing far to little in social housing and selling off cheaply social housing, making it difficult for the poorest and neediest in society to have a permanent home? I would love to live in a country where the needy have a permanent home and the PRS just caters to those better off who choose to rent rather than buy and to those who need temporary accommodation for work or other reasons, but until the government changes its policy from “subsidise home buyers” (some recent government announcements I have seen suggest £20K+ for first time buyers) to “homes for all”, it is the PRS that is attempting to fill the gap. a) Councils can only grant (or not) planning permission on developments that are put to them. By and large, (with some exceptions), they can’t refuse on the basis of over supply, unless there is some other issue. PRS landlords piling in on wholly speculative promises of high returns might be an issue, yes. But I completely agree on building social housing. Owner-occupiers used to be taxed on imputed rent (the theoretical rent that their property would command). They received tax relief on their mortgage interest because that was seen as part of the cost of achieving the “rent”. Tax on imputed rent was abolished in 1963, but owner-occupiers continued to receive mortgage-interest tax relief until 2000. In contrast, landlords are taxed on rent received (less costs). The removal of mortgage interest as an allowable expense means that many landlords who continue with unchanged business models are being pushed into higher tax bands (without any change in their take-home money) and some have lettings tax bills that exceed their lettings profit. Also owner occupiers do not pay capital gains tax when they sell. PS I quite agree that Help to Buy just puts up prices charged by builders. Social housing isn’t subsidised. Full stop. For council housing quite the reverse, social rents pay off the debt for the amount that the councils had to pay to the Treasury. (Social housing rents are a net contributor to public funds). Right to buy isn’t ‘subsidised’. It is a statutorily enforced loss to the council and windfall to the purchaser. I also think it is grotesque and should be stopped. As you agree, there is no mortgage tax relief for owner occupiers. That all said, I’m not a fan of section 24. It was poorly thought through, to say the least. At least for 40% (according to CML) of landlords that are mortgaged. Help to Buy, at £10 billion and counting, is the largest single kind of subsidy, and that subsidy is for the builders. I didn’t say social housing was subsidised; I said (or intended to say) right to buy is a subsidy to encourage home ownership (even if it is enshrined in law). I say it is a subsidy because it is failing to realise the full value of the asset and is passing public money to the purchaser.. Yes there is a lot we agree on (here and elsewhere). We have built for rent in the past, but it’s near impossible now due to the pitiful standards of the staff in Planning at LA’s and being outbid for plots by, what I consider to be, sizable developers who wouldn’t have been interested in the site 15 years ago, and yes, I was on the tools for those jobs. One of the problems with S8G8 is that a tenant who has not paid the rent for several months can make a false claim of disrepair at the hearing, which immediately results in the case being adjourned, so the tenant gets several more months of rent-free accommodation (whilst the landlord still has all his bills to pay) and there is no come-back on the tenant for this. Perhaps if it was treated as contempt of court, then that sort of tenant would think twice before making false claims. Or perhaps the defence should have to be notified to the court within, say, 2 weeks of court papers being served on the tenant for the defence to be considered, and hence giving the LL time to investigate the claims before the court date. Assuming that the person bringing the section 8/Ground 8 claim is competent, then there is a claim for rent arrears as a money claim. That is ongoing. So the tenant will be liable for the unpaid rent at the point of judgment. The accommodation isn’t ‘rent free’, and you are wrong to say that. And there is also ‘come back’ because if the counterclaim fails, the tenant is also highly likely to be ordered to pay the landlord’s costs in full. Now, technicalities. On a ground 8 claim, the court cannot adjourn if it has heard any evidence sufficient to establish that ground 8 is made out. The court’s ability to adjourn is very limited, effectively only if something is raised before any evidence is heard. If a counterclaim is brought that is fundamentally dishonest, then it can be struck out, and there is a potential finding of contempt of court, with possible imprisonment. (See https://www.anthonygold.co.uk/latest/blog/contempt-court-personal-injury-proceedings/ for examples in personal injury). So that is already the case that a false counterclaim can result in contempt of court. My experience is that such counterclaims by tenants in person are rarely wholly false. They may be exaggerated, or inaccurate on period of the problems, or on when and whether notice was given to the landlord, and often wrong on actual liability in law, but very rarely completely invented. As initial possession hearings are listed for 10 minutes or so, whether or not the landlord has had time to investigate the claims before the hearing or not will make no difference to whether it gets adjourned. If there are contested facts at all, it will very likely get adjourned. But all the available evidence is that the main reason for adjournments in s8/Ground 8 claims is that the landlord hasn’t presented clear enough or adequate evidence to establish the arrears. The “rent free” point is that often tenants that do not pay the rent do not have any assets that the landlord can pursue, so an award of costs and order to pay the rent is worth nothing. Re contempt: Is it for the landlord to suggest to the Judge that the tenant is in contempt where the disrepair claim is false, or is there some other process? I see that you acknowledge that there are tenants that invent disrepair issues; whilst these may be rare, for a landlord involved it can have significant financial implications. Well that was rather my point – it isn’t rent free. The law can’t make someone worth claiming against, though. It would be for the landlord to raise, once the court had found the claim was without any basis (note, not just exaggerated, or mistaken in law, or lacking evidence). I’ve never encountered a wholly false disrepair counterclaim. I’ve seen a few that were without merit on legal grounds, and some that were not as bad as claimed, or where claims about the effect of the defects were not substantiated. I’m prepared to accept that someone inventing a counterclaim completely may happen. But I don’t think it is common. If the tenant has not paid and there is no prospect of the landlord being able to recover the unpaid rent from the tenant, then what term wold you use to describe the tenant living in the property without making financial contributions to the landlord? Debt. And indeed a judgment debt when ordered. Same as any contractual agreement where the paying party defaults. If you weren’t paying your mortgage payments, would you call that living there mortgage free? Why some landlords insist that somehow not paying rent should be a criminal offence (fraud, theft), but, for instance, defaulting on your gym membership credit agreement isn’t one escapes me. It just sounds like special pleading.